The US-backed Syrian Democratic Forces entered the Islamic State group's de facto Syrian capital Raqa in June. BEIRUT - The US-backed Syrian Democratic Forces, an alliance of Kurdish and Arab fighters, now controls more than two-thirds of the Islamic State group's former Syrian stronghold Raqa, a monitor said Thursday. The SDF entered Raqa in early June, after months of fighting to encircle the city with support from the US-led coalition against IS. The militia "controls 70 percent of Raqa after taking the Al-Thakana district in the centre of the city," said Rami Abdel Rahman, director of the Syrian Observatory for Human Rights monitor. "The advance was made possible by violent clashes and heavy air strikes by the international coalition," he told AFP. "We can say that the battle for Raqa has entered its final phase," he added. "The end of fighting will be dictated by the international coalition. Air power will be the main, determining factor." The fierce fighting has pushed civilians to flee away from the frontline into remaining IS-held areas in the north of the city, the monitor said. Tens of thousands of people have fled the fighting since the SDF offensive began. The UN estimates up to 25,000 people could remain trapped in the city, though the Observatory said the number is now fewer than 10,000. The monitor said "a few hundred" jihadists remain in the city, adding that the SDF was continuing to sustain losses, with IS using mines and snipers to target the attacking force. 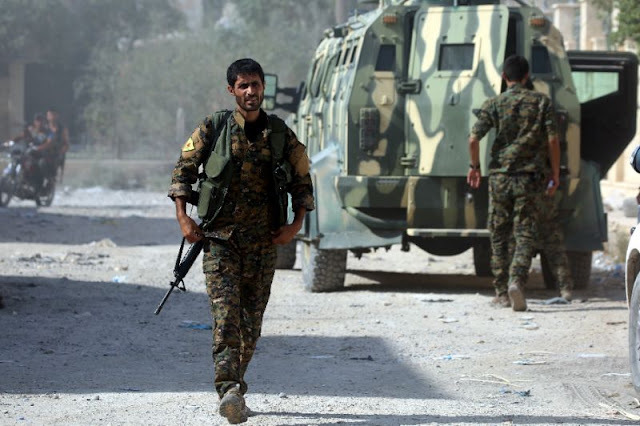 The SDF is also fighting a separate campaign in neighbouring Deir Ezzor province, seeking to push the jihadists from territory they control in the oil-rich region that borders Iraq. More than 330,000 people have been killed in Syria since the conflict began with anti-government protests in March 2011 before spiralling into a brutal civil war that has drawn in international players. The US-backed Syrian Democratic Forces, an alliance of Kurdish and Arab fighters, now controls more than two-thirds of the Islamic State group's former Syrian stronghold Raqa, a monitor said Thursday.